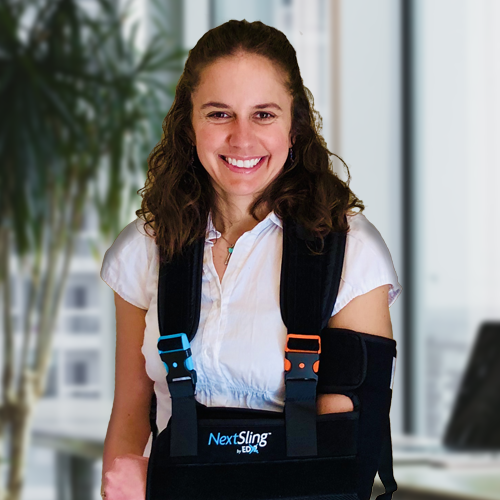 The NextSling® is the all-in-one backpack shoulder sling designed by medical experts to immobilize the shoulder, eliminate the strain on the neck, and distribute the weight of an injured limb for improved patient recovery, rehabilitation, comfort, and ease of use. 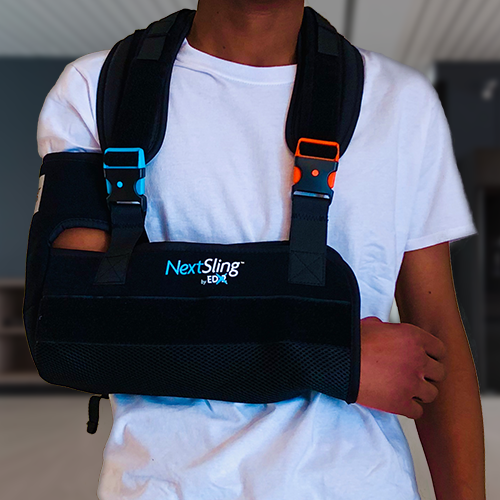 How easy is the NextSling to use; simply slip it over your head, adjust, and start recovering. Board Certified in Orthopaedic Surgery and also in Hand Surgery, Dr. Edward Bieber, M.D., M.B.A., graduated from Yale University and Georgetown University School of Medicine, and continued his orthopaedic training at Johns Hopkins University followed by a fellowship in hand and upper extremity at the Mayo Clinic. He has served as Chairman of the Department of Surgery, Orthopaedics, and the Medical Staff at Suburban Hospital. 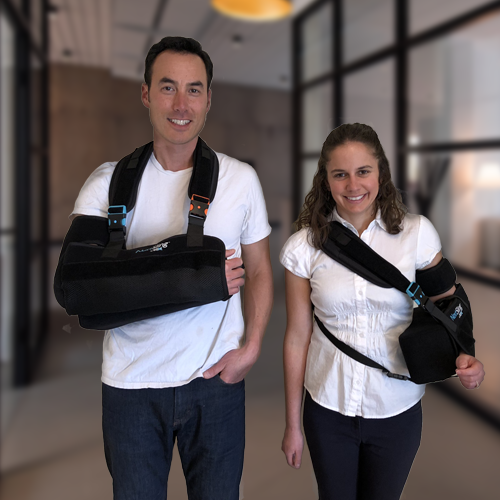 EDX2, the company behind the NextSling, is an orthopaedic business incubator that works hand-in-hand with medical professionals to design, incubate, manufacture, and distribute next-generation products and technologies. 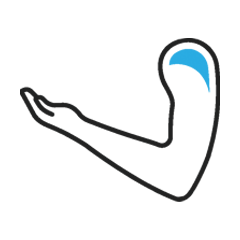 The EDX2 mission is to create major advances in patient care, rehab, recovery, and comfort by collaborating across the patient care team. 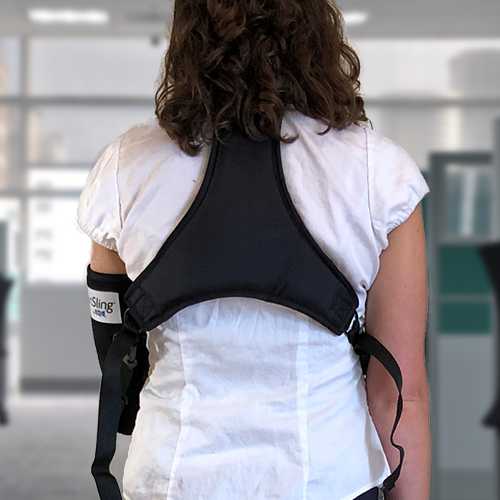 Eliminates the strain on the neck through equal load distribution to the shoulders and back. Ease of use with putting on, taking off, and switching shoulders. 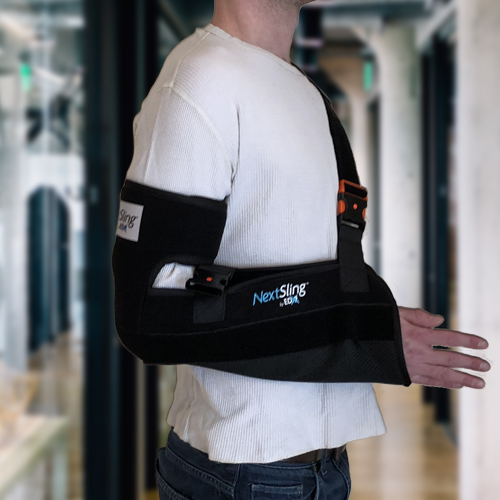 Secures the patient’s arm from slipping and prevents typical thumb compression. 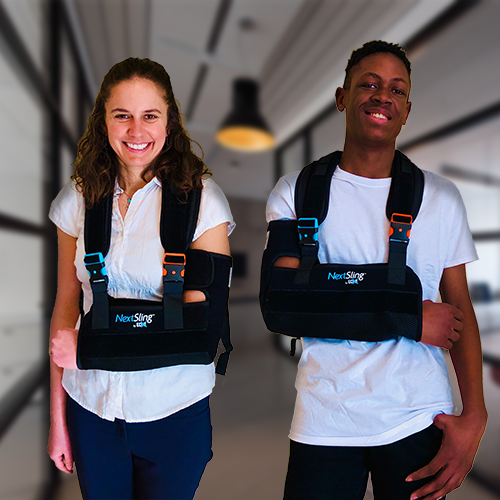 Distributes the load better across the back and shoulders, secures the sling to the body, and stabilizes the arm and shoulder. Infinite angles, decreases tension on the repair, positions the arm optimally, and can be used for rotator cuff surgery. Abduction pillow optional. 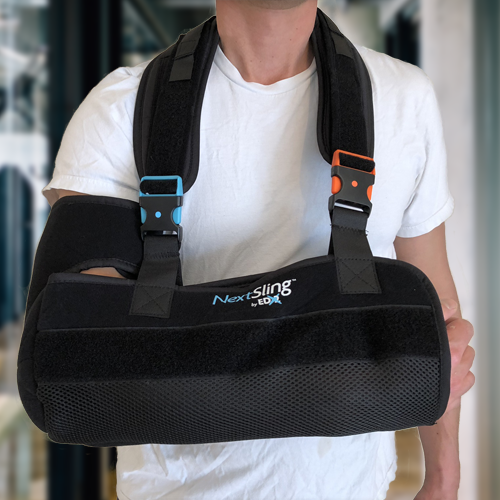 Reduces the chance of developing bursitis in the elbow, which results from long-term traditional sling use. Universal right or left side fit for ease of use and improved inventory management. 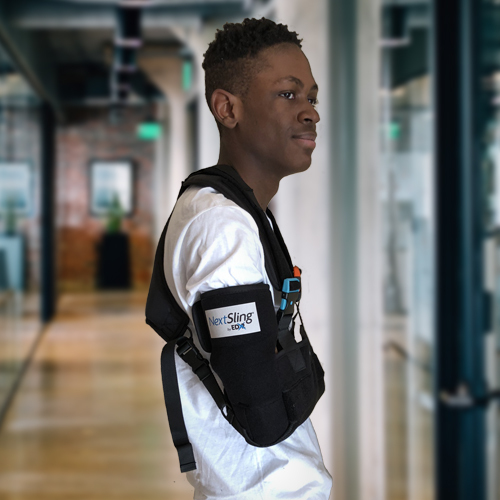 Unlimited adjustments to ensure that the shoulders, back, arm, wrist, and hand are comfortable, secure, and positioned for maximum recovery.